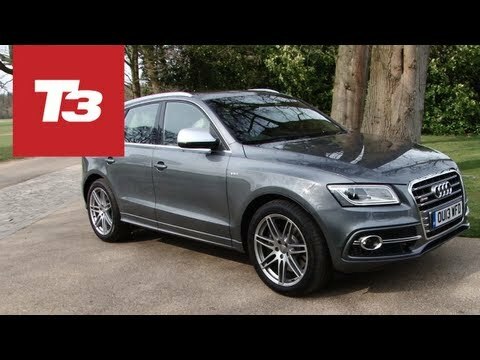 The Audi SQ5 is a sleeper. You have to look hard at the details, like the quad exhaust pipes, wider wheels and tires and silver-toned trim to see there's something special here. But realize the SQ5 is pretty special. Behind the grill is a massaged version of the robust 333 hp supercharged 3.0-liter V6 from the Audi S4. But here they've dialed-up the boost and bolted on a new intake and exhaust system to deliver 21 more horsepower and 22 more lb-ft of torque. Yes, the V6 is paired to the ZF 8-speed automatic and not a version of the company's fun-loving dual-clutch gearbox. But the ZF automatic has been re-tuned to deliver crisper shifts and quicker downshifts. And when pressed hard, this is a mean beastie. Audi says the SQ5, will hit 60 mph in 5.1 seconds.